Kitchen is the most dangerous place in the home. Especially the young children are at a great risk. Most of the residential fire calls are related to the kitchen. Maximum injuries occur in the kitchen than any other room in your home. Knives and other sharp edged things. Fires and other hot things. Here are some simple Do's & Don't to help keep your kitchen safe. Have a first aid box in kitchen with all primary necessary things. Oven and stovetop must always be kept clean as the grease and food residue can catch fire. If a grease fire erupts in a pan kept on the stove, cover the pan with a lid or a larger pan quickly and carefully. If the fire is in the oven, turn the controls off and close the door tightly. Always puncture plastic pouches and plastic-wraps covering the food before heating, to reduce the risk of steam burns. Have a fire extinguisher of appropriate size kept handy and make sure that it is refilled before it is expired. All electrical points should have proper earthing. The mainlight switch should always be placed near the entrance of the kitchen. Defrost your refrigerator on a regular basis. Heating appliances like oven should be kept at a safe distance from the refrigerator. Some items are not "microwave safe" and may become very hot or even burst when heated in the microwave oven. Care should be taken while handling such items. Use a pot holder to remove lids and coverings from heated containers to prevent steam or contact burns. If somebody gets a burn, it is advisable to immediately run cold water or apply a little of the toothpaste over the burn. Taps that leak should be immediately attended to. If the floor is slippery due to spillage of oil, sprinkle some salt first and then wipe clean twice or thrice, using hot water and detergent. Pests/rodents etc. should be controlled as not only are they harmful to health, they are also likely to damage cables, pipelines, appliances which could be dangerous. 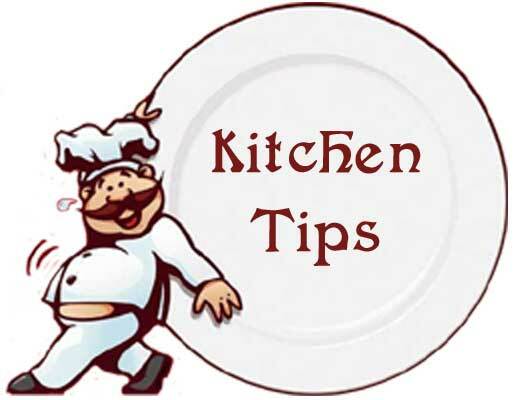 Use cotton clothing while in kitchen; polyester and nylons should be avoided. Always keep knives & sharp edged utensils at a safe place and out of the range of children. Don't cook sour dishes (like tamarind based dishes) in a non-stick pan as the sourness will remove coating faster. Don't overload electrical circuits. Unplug appliances when not in use. If an appliance smells, doesn't function correctly, or has naked or broken wiring, have it repaired or replaced. Don't remove baking trays from the oven with naked hands. Don't wear long, loose sleeves that can hang over the stove while cooking. Don't through water on any fire erupted due to electrical short circuit or because of some greasy products. Don't keep medicinal products near the reach of the children. Don't operate electrical gadgets with wet hands and without rubber slippers. Don't let a child enter the kitchen when the oven is in use because an oven door can get hot enough to burn a youngster who might fall or lean against it.